FILE - The Trump Soho hotel in New York, Dec. 6, 2016. The Trump SoHo hotel is dropping the name it shares with the U.S. president. The Trump Organization said Wednesday that it is ending its licensing deal with the New York hotel amid reports that the property has struggled to attract business. The company owned by President Donald Trump said that it has signed a deal with the owners of the hotel and residential tower to end management of the property and the use of the Trump name. The announcement comes as the company's other hotels and resorts around the world are showing mixed results. The tower in the hip, touristy Manhattan neighborhood of SoHo has been the source of controversy and trouble for years. One of its original backers turned out to be a businessman convicted in a Mafia-linked stock fraud scheme. Later, Trump's three oldest children were alleged to have defrauded buyers of condominiums in the building in a case that was settled in 2011. Last month, a New York City prosecutor who had dropped a probe sparked by the fraud suit returned a $32,000 campaign contribution from a lawyer who represented the Trump Organization in the investigation. The prosecutor said the contribution had no impact on his decision to drop the probe. There have also been signs of business trouble recently at the Trump SoHo. Its sushi restaurant closed earlier this year, and The New York Times has reported a drop in room rates at the hotel and slow sales of condos in the residential part of the building. The president's company said it would have no comment beyond its news release announcing the move. As is the case with many Trump-branded properties, the Trump Organization doesn't own the Trump SoHo. Other hotels and resorts bearing the Trump name appear to be struggling, while some are booming. Last month, the British government published financial statements showing losses more than doubled at his two golf clubs in Scotland last year. Business at his golf courses in Los Angeles and New York City are also down, according to reports based on government records. His opulent Washington, D.C., hotel is doing fine, though, attracting lobbyists and foreign diplomats with business in the capital. 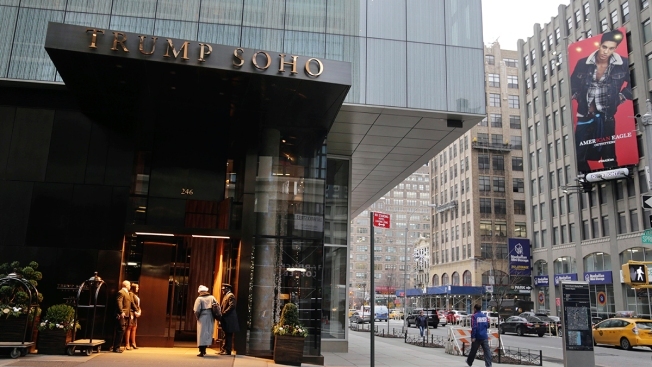 The Trump Organization described its agreement with CIM Group and other owners of the Trump SoHo as a buyout deal that will allow it to end its management and licensing agreement by the end of the year.